To keep up a BOMBSHELL glow you have to properly fuel your face! You can treat your skin from the inside out with foods high in Vitamin C, E, Selenium, zinc, beta carotene and other essential nutrients. VITAMIN C is a super antioxidant strengthens capillaries that support skin, nurtures more radiant skin, aides in preventing blemishes, and most importantly produces collagen! 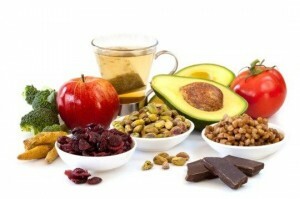 VITAMIN E protects skin from oxidative damage and supports healthy skin growth. 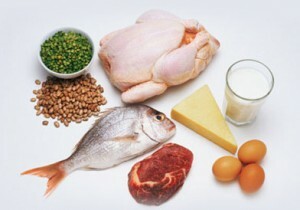 SELENIUM is a powerful antioxidant that protects your skin against cancer, sun damage and age spots. 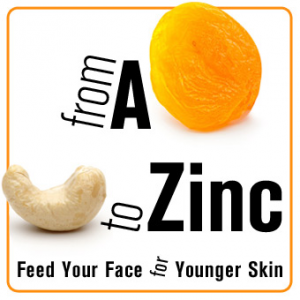 Zinc supports the production of oil in your glands to help keep the skin stay soft and supple. FOLLOW your BOMBSHELL diet! YOYO dieting takes a toll on the skin, which causes sagging, wrinkles and stretch marks! 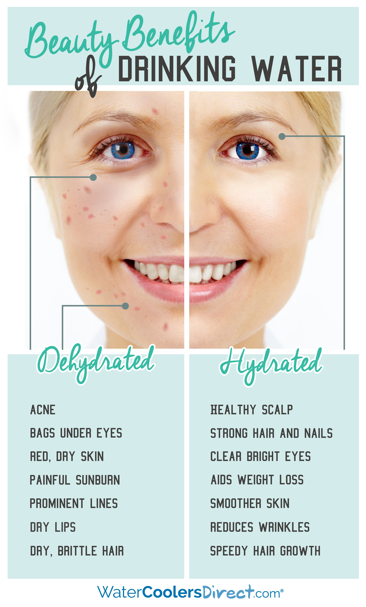 Water is the most important ingredient for your skin. It keeps your skin hydrated, making it appear more plump and with less wrinkled. Water also flushes out toxins, which can help ward off signs of aging. Even just a little dehydration will make your skin look dull and less plump. Monounsaturated and polyunsaturated fatty acids provide moisture for the skin and keep it supple. These fats also have high doses of Vitamin E, which as you learned above protect us against oxidative damage. Olive oil – 75% monounsaturated fatty acids, which gives the skin a youthful boost. The antioxidant polyphenols in the oil helps with free radicals that damage and keeps the skin glowing and youthful. Almonds – Contains zinc and selenium which aides in acne prevention. The Vitamin E, copper, magnesium, manganese, potassium, calcium and iron keep the cell membranes strong which is crucial to a youthful glow. Omega-3 – This is an essential fatty acid which has several benefits; one being the anti-inflammatory compounds. This is really important for people with eczema and psoriasis. 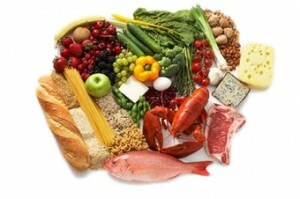 Low Glycemic Carbohydrates are a great source of Vitamin B, selenium, magnesium, and several antioxidants. These all help aid in healthy skin production, inflammation and red spots. Brown Rice – Brown rice is rich in essential minerals such as manganese, iron, zinc, phosphorous, calcium, selenium, magnesium, and potassium. Vitamins include B1 (thiamine), B2 (riboflavin), B3 (niacin), B6, foliate, E and K. This super food is packed with fiber and fatty acids, which help your skin look great from the inside out. Chickpeas – Helps with wrinkles with its manganese ingredient that fights off wrinkle causing radicals. The molybdenum detoxifies the skin and Vitamin B works to fuel the skin cells and repair damaged skin cells. Oats – Oats are very high in soluble fiber, iron, manganese, calcium, vitamin B, E and silicon. 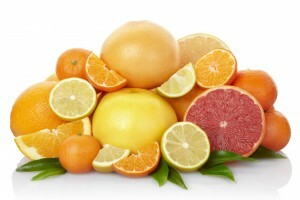 These all benefit the skin, especially silicon which helps maintain collagen. Kale – The best source of lutein and zeaxanthin which are nutrients that absorb free radicals . One cup gives you 135% or you daily skin firming Vitamin A and C.
Spinach – Loaded with Vitamin B, C and E, potassium, calcium, iron, magnesium, and omega 3 fatty acids, which repair and slow down skin cancer cells while maintaining a youthful glow. Asparagus – This powerful food is filled with many nutrients such as vitamin E and C, which are great for overall skin health. 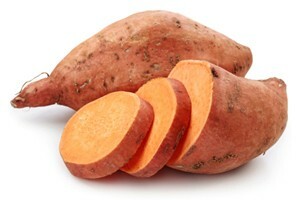 This food is great for preventing dryness, psoriasis, acne, and blemishes. 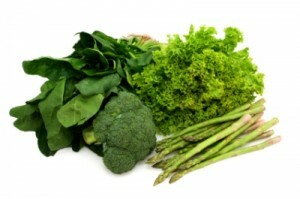 Broccoli – Vitamin A, B complex, C, E, and K help the skin look luminous and revives damaged tissue. Chicken – A great high protein low fat option that is packed with selenium, zinc, niacin, vitamin E, B6, B12 and beta-carotene. Beef – This protein has the highest amount of amino acids which aides in collagen production. Packed with omega 3 and 6 fatty acids, which reduces inflammation. Eggs – Full of skin clearing agents which include selenium and zinc. Yogurt – High in Vitamin A and acidophilus, which is a live bacteria that helps with proper digestion. When the body digests properly it reflects on the skin. Wild Salmon – NOT farm raised – High in omega 3 fatty acids, which keeps the skin supple and moisturized. Salmon also has selenium, which protects from sun exposure and helps in healing.